It’s been a great week of cigars for me. Some have been tried and reviewed yes, but some have been a first for me and I had to talk about them. Last night I finally had the pleasure of trying an E.P. Carrillo Core Line Maduro Club 52. Another great smoke to remember. Construction of this cigar was a little new to me. By new I mean the various colors in the wrapper. Chatting with a friend from my local B&M revealed me to the fact that the wrapper was most likely soaked before wrapping. This may be correct, it may not be but I found it interesting. The construction was excellent. Very minimal veins, a very strong feeling cigar in my hands. The foot gave me a sweet molasses type smell along with earthy notes and maybe some coffe. The pre light draw gave off much of the same. The pre light draw was also perfect. Lighting up this cigar was simple. The first third was an absolute delight. There was the sweet flavor, some coffee, and a very slight spice. The spice wasn’t strong at all and blended around the other flavors. The draw was delightful, producing a perfect amount of sweet aroma smoke. The burn was divine, sharp as a razor. the ash was firm and lighter gray in color. Thus far this smoke has reminded me more of what a Maduro is supposed to be. The second third was as exquisite as the first. The spice really seemed to fade giving into the beautiful sweetness that has made this cigar unforgettable. The burn has stayed razor sharp, ash as tight as before, and the temperature perfectly even. This entry was posted in Reviews and tagged E.P. Carrillo Club 52 Maduro on August 31, 2012 by everikakis. Inspecting the cigar revealed a beautiful construction, flawless if I may. Minimal veins, a nice amount of oil, and no imperfections whatsoever. The foot offered a nice sweet smell along with tobacco notes. Evident also was some pepper. The pre light draw was smooth, some more sweetness, pepper, and tobacco. A straight cut to the cap and there begins the experience. The first few puffs gave a lovely mixture of woodsy notes, a lovely sweetness and a finish of pepper. The first third stayed with these flavors and deeper in there were additions. After some time into the first third a wonderful addition of berry was introduced. It blended extremely well with the rest of the mixture. The draw was perfect, just the right amount of smoke, and the ash was firm becoming a nice white color. Thus far the cigar was extremely pleasing and there was so much more left. I would judge it thus far as a medium body. The second third added again. I was now sensing some chocolate. The berry had subsided a bit, and the woodsy notes were still in play. The pepper stayed at the finish and coated the pallet. The cigar now began to take on a more medium-full bodied feel. The flavors were in abundance and an absolute pleasure. The ash has stayed firm and I’ve only tapped once. The draw, to my surprise, tightened up a bit which I didn’t expect yet welcomed. It really complemented the cigar. The final third gave way to the more woodsy notes and a bit of leather. The pepper stayed still and was a little more amped up for me. Though the pepper was a little more it didn’t play with the enjoyment, the flavors as throughout the cigar, were in a perfect blend. Each puff greeted with it’s flavors, ended with the pepper, and then transitioned back again perfectly. I would’ve poked a toothpick into the nub to help with the end of the cigar, but it was too special of a smoke for me to alter it in any way. I’ll accept the burnt fingertips for this one! This entry was posted in Reviews and tagged Cuenca Y Blanco Corona Real on August 30, 2012 by everikakis. The construction of this beauty was excellent. Minimal veins throughout, and a nice tight feel. Some oil present on the wrapper. The foot gave me some sweet tobacco notes, a slight sense of manure, and some woodsy notes as well. The pre light draw was easy, and gave me a creamy sensation. A cut to the cap and we’re off. The first few puffs were absolutely divine. A creamy sort of base with some slight coca mixed in a dash of spice, and a woodsy taste. The flavors were cavorting around my pallet in a beautiful symphony. The first third was absolutely intriguing. The burn was perfect. Bountiful amounts of smoke being produced, and the draw was superb. The ash held on nice and strong and was light gray in color. The second third kept all flavors in their perfect place. The spice adding a nice touch at the finish. A little further in and I began to detect a slight leathery taste in the finish. A very welcome addition but at this point very slight. A few touch ups here and there were required but nothing terrible, and with a cigar this size I’d almost expect it. I am enjoying this smoke immensely! The final third now says goodbye to the spice. The leathery finish is more dominant and also some cedar is present. The cocoa has pretty much faded as well. I had to touch up once more but no bother like I said before. After almost two hours and my cigar was a nub. This entry was posted in Reviews and tagged Nestor Miranda Special Collection Danno 2010 Rosado Oscuro on August 28, 2012 by everikakis. A.J. Fernandez has established many times that he is a master blender. The San Lotano brand falls right into line. The pre light draw notes coffe, cocoa, and some spice. The construction is a box pressed smoke with no oil that I could notice. It had a dry feel to it. A straight cut to the cap with my Xikar scissors and I’m ready to smoke. Upon lighting the cigar I’m greeted with the same notes as with the pre light draw. Coffee, cocoa, and the spice. The spice was a big part of the finish. The first third went fairly well. An ample amount of smoke was being produced, the draw was perfect, and the flavors stayed as a constant. The burn was pretty good, but every now and again I needed a little touch up. I’ve noticed from cigar to cigar that oils being less present seem to affect the burn. I may be wrong, just something I think I’ve noticed. The touch ups were minimal and didn’t hinder my enjoyment of this stick. The second third was pretty much in line with the first. Good smoke production, the same flavors as before, and a touch up here and there. The final third seemed to diminish the cocoa flavor and added a more leathery finish. The coffee is also a little more bitter and the pepper is still there hitting the back of my throat. No problem taking it down to the nub. This cigar, aside from the few touch ups, was a great smoke from beginning to end. I’m looking forward to picking up some more, and also trying the rest of the line as I’ve heard many good things. As always I thank you for reading, and long ashes to all! This entry was posted in Reviews and tagged San Lotano Maduro Toro on August 28, 2012 by everikakis. Recently I missed an event at Old Havana Cigar Co. that I was told was a great time and always is when Nick Perdomo attends. I regret it and hope to not miss the next. Being that I knew I couldn’t go, I made it a point to stop by before the event and grab a few smokes. They were highly recommended by many of my cohorts at the shop, including the owner Tony. I’m happy to say they were all indeed correct. The pre light offered a strong tobacco scent along with a touch of spice and earth. The pre light draw was easy and promising, with what seemed to me the same flavors. The first third of this smoke was nice and smooth. The first few puffs seemed very mild with a slight spice on the pallet. I was surprised by this as many of my cohorts are more towards slightly stronger smokes, nonetheless I continued with my experience. Not far into the first third began the true flavor. I was greeted with a good tobacco flavor along with and a blast of pepper at the end. I also slightly sensed a hint of bitter chocolate. The burn was nice and even producing a strong tight dark gray ash. The smoke was plentiful and took on a sweet aroma intertwined with tobacco. The second third stayed true to the flavor, not too much changed for me truthfully. The strength of this cigar was a strong medium-full body. The tobacco and chocolate stayed pretty much the same and the pepper was dominant, even at the finish. The final third was just as good as the rest. At times it seemed there was a creamy finish trying to take the steam away from the pepper. This of course didn’t last long as the pepper stayed dominant. No trouble taking this down to the nub. In my business consistency is the most important aspect. If the aim of Perdomo Cigars is such, they have done so with this cigar. An absolute delight from start to finish. As always I thank you for reading and long ashes to all! This entry was posted in Reviews and tagged Perdomo Habano Maduro Toro on August 27, 2012 by everikakis. Tonight’s smoke was a favorite go to of mine. The Rocky Patel Decade Edicion Limitada Toro. You can bet the farm that there’s always a few of these in my humi. They’re a nice kick in the pallet smoke that will command your time, attention, and a beverage right next to you! The pre light offered up some dark chocolate and a fruity taste. The foot gave off earth and a little bit of spice. The cigars are always superbly constructed, dark and oily. Lighting it up sends a good amount of pepper for the first few puffs, dark chocolate and coffe flavors. The first third is nice and strong. The pepper is a big presence. The dark chocolate and coffee are dancing around well. The burn is good and tight and smoke is not a problem, plenty of it. The draw is also something worth noting as it is effortless. The ash holds completely tight and hangs on for a good bit of the stick. The second third is interesting in that rather than taking anything away it adds. I detect an earthiness in compilation with the dark chocolate and coffee. It’s almost like charred wood and I like it. The pepper still remains in the finish to remind me that this cigar is a great full body beauty. The pepper does seem to become a little milder but it is still a player. At this point I gave it a hit with my lighter, but very minimal maintenance just to keep it even. The draw is still excellent, producing plenty of smoke. In the final third it’s return of the pepper. It hits the pallet as in the beginning. The dark chocolate is still there but more in the background. The coffee has seemed to become a little bitter, and the charred wood has more emphasis. Another tiny touch up but again nothing that takes away from the cigar. All in all I can’t say enough about this dark colored beauty. Like I said before there’s always room for these fine smokes in my humidor. The Decade line itself is one that does not disappoint. Rocky knows what he’s doing and these smokes prove it! As always I thank you for reading and long ashes to all! This entry was posted in Reviews and tagged Rocky Patel Decade Edicion Limitada Toro on August 23, 2012 by everikakis. This morning I finally got around to the Emilio Cigars AF2 Toro. I know that this may be my third review of Emilio Cigars, but I had been meaning to try the line for a while, and have enjoyed all so far. I also ordered a five pack of Draig K’s so consider yourselves forewarned, there will be another. The pre light felt nice and smooth. I picked up some woodsy flavors and a sweetness. The construction is flawless, as I’ve noticed throughout the line. Upon lighting the cigar I was greeted with a nice blast of pepper that I didn’t expect to be as strong. Along with the pepper were some earthy tones and cocoa. The first third burned beautifully with a light grey ash. The smoke was very aromatic and ample. The ash itself held up to about 2″ and then I tapped it into my tray. Good medium-full body at this point. The second third took away the pepper. Instead I sensed more the earthy tones, cocoa, and now a nutty flavor. The cigar takes on a more smoother approach for me at this point becoming a more medium body. The ash stayed nice and tight and the burn spectacularly even. This is another well constructed smoke. The final third brings back the medium-full bodied feel of the smoke. The pepper is back in the finish, only now along with the earthy notes and nutty flavors I could swear I was tasting roasted marshmallows. What a great addition. I feel like a kid again! Sorry it just made me smile. As for normal fashion I nubbed this baby out and was a happy camper. Puns are fun. This cigar was an absolute delight and I can’t wait to smoke another to see if I pick up the same flavors. Pick some up you won’t be sorry! As always I thank you for reading and long ashes to all! This entry was posted in Reviews and tagged Emilio Cigars AF2 Toro on August 23, 2012 by everikakis. Tonight another gorgeous smoke by Emilio Cigars. The AF1 Toro. My first try of Emilio Cigars’ Series H Maduro Robusto was an absolute smoke of the year for me, so I couldn’t wait to give the AF1 a dance. Again it did not disappoint in the least so please read on. The foot offered up some dark chocolate, pepper, and earthiness. Upon cutting the cap I sensed more of the same with the pre light draw. The construction was perfection from top to bottom. I truthfully noticed no imperfections, and very few veins. The cigar lit with no problems and I was ready to go. The first third was extremely interesting. My first few puffs offered up a predominant taste of spice, with some dark chocolate, and earth in the background. The smoke was such a pleasing aroma and plenty of it. The burn was nice and even and the ash was a light grey and fantastically firm. So far it has been a solid medium-full body for me. Into the second third and still enjoying it immensely. The pepper has subsided a bit and become more apparent in the finish on the pallet. The chocolate and earth are more dominant at this point with also a pleasant addition of a nutty flavor. The burn is consistent and the temperature of the cigar is perfect. Thus far it has been, for me, as intriguing as the Series H Maduro. I have to admit after having such a delightful first impression I didn’t think it could be repeated, I was happily wrong. The final third greets me with more of an emphasis on the earth and chocolate. The pepper has pretty much faded into the rest of the flavors. The nutty flavor is still there, and like the Series H Maduro, all flavors are in perfect harmony with the rest. The temperature is still great and the burn is impeccable. I’ve tapped ash into my ashtray twice, (only for personal preference), yet I feel that it has held so firm after each ash that I may be able to have an anti-gravity contest should I want to. No problem in taking this baby to the absolute finish. I can honestly say that the high standards that I understand are of total importance to Emilio Cigars’ Mr. Gary Griffith have shown true in these last two cigars I have smoked. Naming them in honor of Mr. A.J. Fernandez is also another highpoint to me, his master blending is evident in this line as well as his own. I can’t wait for the next! Always my friends I thank you for reading, and long ashes to all! This entry was posted in Reviews and tagged Emilio Cigars AF1 Toro on August 21, 2012 by everikakis. Tonight’s flavor is a first for me. I have heard some really good things, so I stopped and picked up a few smokes. My choice tonight was the Emilio Cigars Series H Maduro Robusto. Let me say I am so glad I chose this cigar. Read on and I’ll try to convince you. The pre-light draw was extremely easy, and I sensed some coffee and chocolate, so my hopes were up from the start. Smelling the foot provided me with earthy tones. Lighting the Emilio was as easy as the draw and in no time I was puffing away. The first third was a great beginning. Dark chocolate and coffee seemed to be the flavors front and center. The background and retrohale offered a nice addition of pepper. The ash is burned at a dark gray, and held very strong. the burn itself was perfect in every regard, even and producing a great amount of sweet smoke. I also from time to time thought I noticed a sweetness that I’ve yet to figure out. I’ll have to smoke another and observe closer, which at this point I’ll have no problem doing. The second third was an absolute delight as well. The pepper is still faintly in the background but fading. Replacing the pepper is now some earthy tones. The joy of this is that all of these flavors seem to be dancing together on my palate in perfect balance. The smoke is still at a great level, the ash is holding up well and the temperature is perfect. Have I mentioned I’m really enjoying this cigar? The final third sees the pepper give way to the rest of the flavors. The chocolate, coffee, and earth are still in perfect harmony. I have absolutely no problem in taking this smoke all the way to the end. My only complaint is that I have to wait until tomorrow for another. The cigar proved to be a medium- medium full body. The Emilio Cigars Series H Maduro Robusto will definitely be a welcomed addition to my humidor family, and rightfully so. As always I thank you for reading, and long ashes to all! This entry was posted in Reviews and tagged Emilio Cigars Series H Maduro on August 19, 2012 by everikakis. Being the fact that there was an unexpected monsoon this evening, I’ve used a photo that i snapped off a little while ago. I decided to come home tonight after work, rather than visiting my favorite shop but mother nature let me know that my choice was the wrong one half way home. All I can say is that garages aren’t just a safe haven for cars! Now to the Tempus. Tempus defined from latin is time. That’s what is needed for this baby, and I don’t mind at all. This offering from Alec Bradley is definitely one of my favorites and a staple in my humidor. The Tempus Maduro Medius 6 has an absolutely beautiful construction. Once lit I pick up an array of flavor such as pepper, chocolate, and coffee. The pepper seems to be the most dominant flavor in the first third of this cigar. The first few draws are a little tight but once warmed up there’s no turning back. The burn is nicely even and the ash holds firm, appearing light gray. The smoke produced has a nice sweet aroma. So far I’d say it’s a medium body. The second third is even more delightful as the pepper seems to fade a bit and give way to the chocolate, coffee, and some cedar. the burn has stayed even and the ash is still intact. The smoke is a little more ample at this point and it feels to be gaining a little strength. I’d still say medium but I already know what happens later. Speaking also on the time I was about an hour in at this point. Give or take a few, but the relaxation factor that goes hand in hand with cigars has made me not look at the clock and just enjoy my time with this stick. The final third is a nice little transition as well. At times I sense that pepper from the beginning, though at this point it tastes like it’s blending with the chocolate and coffee, and leaving the cedar for the finish. Smoke is still ample, maybe a little more than previous. Getting to the nub of the Tempus leaves mostly a heavy cedar taste. I also have forgotten to mention that the temperature of the cigar itself has remained consistently perfect. In the end I can rest assured that I should try to have chopsticks or something of the like on hand for the finish of the Tempus, and also as said, time! I may be wrong but I estimate that an hour and a half for every time I smoke one. If you haven’t already please try them, you will not regret it. Thanks for reading and as always long ashes to all! 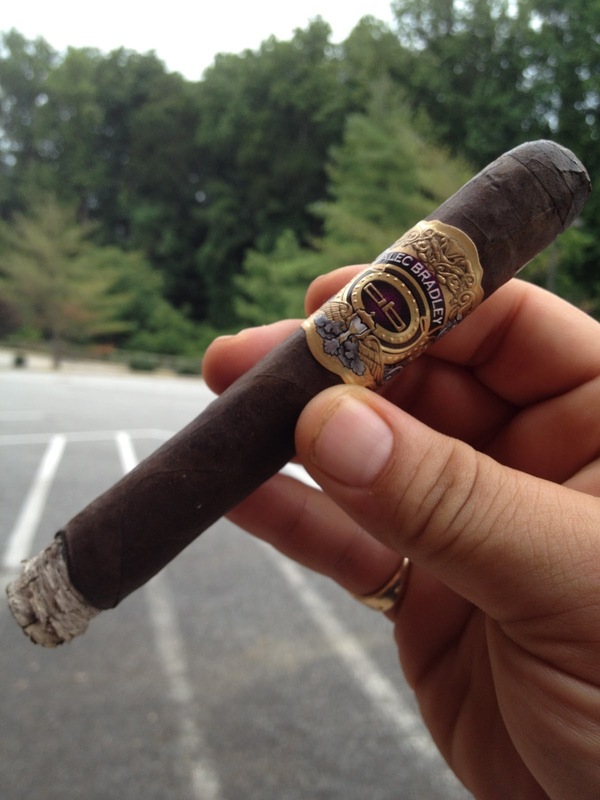 This entry was posted in Reviews and tagged Alec Bradley Tempus Maduro Medius 6 on August 18, 2012 by everikakis.